After years of struggles, Bedouins in Israel are slated to get ownership of Negev lands, a draft report to be presented to the government indicates. A team tasked with implementing changes in the status of Negev lands will likely recommend that the government hand over extensive plots of land to the Bedouins and provide them with compensation amounting to billions of shekels. Sources involved in the case told Ynet on Thursday the Bedouins may oppose the plan as it will only see them receiving ownership of 50% of the lands they occupy and be compensated for the other 50%. The team was instructed to present the government with recommendations on how to solve the status of Bedouin settlement in the Negev, pursuant with the 2008 Goldberg report. Sources said that the government will soon discuss the recommendations. According to the team's proposal, 50% of Bedouin claims on agricultural lands they currently occupy will be granted. A source familiar with the issue said this will effectively mean some 200,000 dunam will be listed as Bedouin territory in the land registry bureau. The draft indicates that for uninhabited lands the Bedouins will receive large sums in compensation or alternative lands. The compensation will be provided only after the lands are evacuated and will be anywhere between NIS 2,000 and NIS 10,000 per dunam. Several billions may be paid in total. The new plan aims to provide a solution to what the State has described as a "ticking bomb," by legalizing tens of thousands of illegal Bedouin structures in the Negev and reinforcing the enforcement system in the area. Sources familiar with the issue said the recognition of Bedouin ownership may open a gate for settlers whom the state evicted from their homes to demand equal terms in court. "Netanyahu is taking a major risk, both publically and politically," said Ramat Negev Council head Shmulik Rifman. "If they don't finalize the Bedouin settlement it will be very hard to enhance Jewish settlement in the Negev. This must be addressed if one wants 700,000 Jews in the Negev." In December 2007 the Olmert administration established the Goldberg committee tasked with finalizing the status of Bedouin lands in the Negev. A report submitted a year later recommended that some of the Bedouin claims be recognized. In January 2009, the government formed a team to implement the recommendations. The Prime Minister's Office said in response: "The Goldberg report was issued two years ago. There have since been many discussions regarding a plan to implement the recommendations. The version you hold is not the final version." 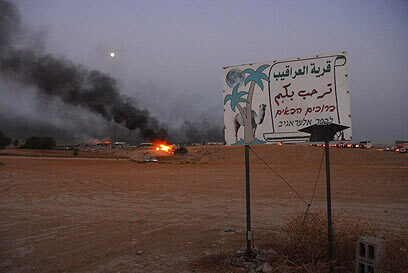 See all talkbacks "Bedouins slated to get ownership of Negev lands"